Chris Wood scored a second-half equaliser as Leeds United were held to a fourth successive Championship draw by neighbours Sheffield Wednesday. Marco Matias put Wednesday ahead in the Yorkshire derby with a stunning opener. The winger controlled Liam Palmer's long pass forward and flicked the ball over the head of Leeds defender Liam Cooper before volleying past goalkeeper Marco Silvestri from 18 yards. Wood levelled for Leeds, turning in a Stuart Dallas cross from close range. Leeds have now drawn all four league matches under head coach Uwe Rosler, while Wednesday are a point above them in the Championship table having failed to hang on to their one-goal lead at Elland Road. A dull first half was lit up by a superb goal from Matias eight minutes before the break, the Portuguese winger scoring for the first time in English football. Clear chances were otherwise scarce before half-time, with Leeds coming closest to an equaliser when Wood failed to divert Dallas's cross-shot into the net just before the interval. The hosts introduced midfielders Alex Mowatt and Luke Murphy from the bench 10 minutes into the second period, and Leeds were level soon afterwards as Dallas nutmegged his defender before sliding an inviting ball across the six-yard box, which Wood tapped home for his second goal in two games. Silvestri kept out Palmer's header, while Wood nodded Charlie Taylor's cross wide as both sides tried and failed to find a winner. Leeds head coach Uwe Rosler: "We say the glass is half full, not half empty. "It was our fourth game in nine days, which is very hard, especially at this early stage of the season, but we have come through those games unbeaten and I am delighted. "We went behind to a wonder goal - congratulations to them for that. I haven't seen a better goal than that, but we did well to come back and score a very good goal of our own, which showed the character we have in the team." Sheffield Wednesday head coach Carlos Carvalhal: "Marco is a player who has come into the Championship and he was a big influence in our team today. "He will be an even better player in the future because he was very tired when he came off with 15 minutes left and we have played a lot of games in a very short time. "Marco's goal was very special. He showed excellent technique. He wasn't so good against Reading in midweek but he made up for that today." 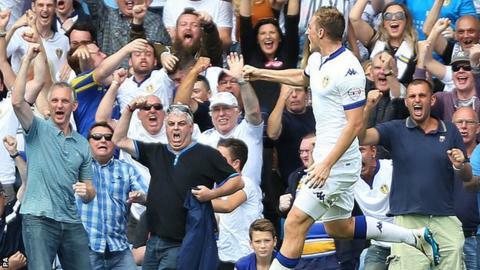 Match ends, Leeds United 1, Sheffield Wednesday 1. Second Half ends, Leeds United 1, Sheffield Wednesday 1. Offside, Leeds United. Liam Cooper tries a through ball, but Chris Wood is caught offside. Souleymane Doukara (Leeds United) wins a free kick in the attacking half. Attempt blocked. Mirco Antenucci (Leeds United) left footed shot from outside the box is blocked. Assisted by Souleymane Doukara. Offside, Leeds United. Charlie Taylor tries a through ball, but Mirco Antenucci is caught offside. Attempt blocked. Álex López (Sheffield Wednesday) left footed shot from outside the box is blocked. Foul by Alex Mowatt (Leeds United). Rhoys Wiggins (Sheffield Wednesday) wins a free kick in the defensive half. Attempt missed. Liam Cooper (Leeds United) header from very close range is too high. Assisted by Alex Mowatt with a cross following a corner. Corner, Leeds United. Conceded by Álex López. Corner, Leeds United. Conceded by Rhoys Wiggins. Attempt blocked. Chris Wood (Leeds United) right footed shot from outside the box is blocked. Assisted by Alex Mowatt. Attempt blocked. Atdhe Nuhiu (Sheffield Wednesday) right footed shot from outside the box is blocked. Assisted by Liam Palmer. Attempt blocked. Jeremy Helan (Sheffield Wednesday) left footed shot from outside the box is blocked. Assisted by Sam Hutchinson. Offside, Leeds United. Gaetano Berardi tries a through ball, but Chris Wood is caught offside. Substitution, Leeds United. Souleymane Doukara replaces Stuart Dallas. Substitution, Sheffield Wednesday. Álex López replaces Josè Semedo. Delay in match Sol Bamba (Leeds United) because of an injury. Charlie Taylor (Leeds United) wins a free kick on the left wing. Foul by Mirco Antenucci (Leeds United). Tom Lees (Sheffield Wednesday) wins a free kick in the defensive half. Jeremy Helan (Sheffield Wednesday) is shown the yellow card for a bad foul. Luke Murphy (Leeds United) wins a free kick in the defensive half. Foul by Jeremy Helan (Sheffield Wednesday). Attempt blocked. Chris Wood (Leeds United) right footed shot from the centre of the box is blocked. Assisted by Gaetano Berardi with a cross. Foul by Tom Adeyemi (Leeds United). Josè Semedo (Sheffield Wednesday) wins a free kick in the defensive half. Offside, Sheffield Wednesday. Josè Semedo tries a through ball, but Atdhe Nuhiu is caught offside. Liam Palmer (Sheffield Wednesday) wins a free kick in the defensive half. Attempt blocked. Mirco Antenucci (Leeds United) right footed shot from outside the box is blocked. Attempt missed. Mirco Antenucci (Leeds United) right footed shot from the left side of the box misses to the right. Assisted by Sol Bamba. Substitution, Sheffield Wednesday. Jeremy Helan replaces Marco Matias. Attempt saved. Alex Mowatt (Leeds United) left footed shot from outside the box is saved in the bottom right corner. Sam Hutchinson (Sheffield Wednesday) is shown the yellow card for hand ball. Hand ball by Sam Hutchinson (Sheffield Wednesday).